A submersible mission in Antarctic waters has revealed unique ecosystems so rare they deserve special protection, say scientists. The seabed investigation, co-ordinated by the campaign group Greenpeace, will help build the case for the creation of the world's largest wildlife sanctuary. Her work will go towards categorising the parts of the seabed that she finds to be particularly unique as "vulnerable marine ecosystems". 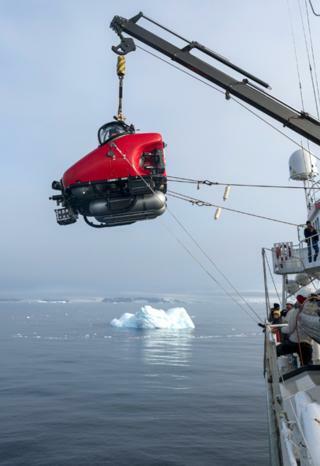 "I have looked through the footage and at a particular dive site in the Antarctic Sound. It's really exciting, with a really dense seabed full of life and diversity," she told BBC News. "These [lifeforms] can be very vulnerable to disturbance. I will submit my findings to the committee that looks after these waters and hopefully they will be given special protection." These tiny shrimp-like creatures are used to make fish food to feed farmed stocks. They are also a rich source of omega-3 used in food supplements. However, the crustaceans are a keystone species that sit at the base of a food chain that supports higher animals including whales, seals, penguins and the region's albatrosses and petrels. Disturbances in krill supply can have damaging effects further up the food chain. The body responsible for managing the exploitation of marine resources around the White Continent is the Commission for the Conservation of Antarctic Marine Living Resources, or CCAMLR. It is made up of 24 member states (and the EU), and they must approve any reserve proposal unanimously. There is evidence that marine reserves only work with proper policing and resources for enforcement, but Frida Bengtsson, head of the Greenpeace mission, does not see this as a barrier. "I think today when we have increased satellite cover, for example - I think the use of modern technologies is going to be very important for making sure that no activities happen in these sanctuaries. "We have the tools; it's just having the willingness to use them." At their meeting in October 2016, CCAMLR members agreed to create a reserve in the Ross Sea on the other side of the continent. The restricted area encompassed some 1.6 million sq km. The Weddell proposal was formulated by Germany and submitted by the EU. It has UK support.